Follow the cliffs' edge for lovely views of the river below. A path bordered by a rail fence leads along the riverbank. Oaks, dogwoods and other trees line the path, often cloaking views of the river with a veil of Spanish moss. Though the cliffs formed over millions of years, irresponsible actions on the part of man could destroy them in no time. To preserve this beautiful formation, climbing on the cliffs is not permitted. 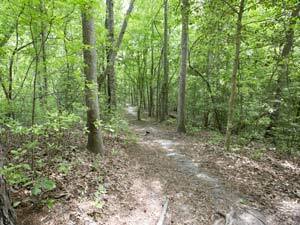 Follow park trails to creeks that were once used to make moonshine and cornmeal. Mill Creek was the home of a gristmill that processed grain while federally-operated whiskey stills were located along Still Creek. Today, the area where these creeks empty into the Neuse River serves as a place to fish and enjoy nature. Location: End of Park Entrance Road. Public restrooms adjacent to parking lot. 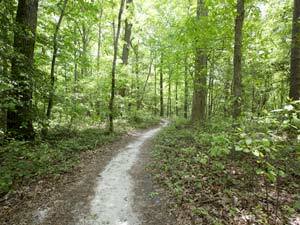 The 350 Yard Trail at Cliffs of the Neuse State Park is the park's shortest trail but remains the access to the park's signature natural feature; the 90-foot overlook that stands above a 90-degree turn in the Neuse River. For many years this overlook was a major attraction for the residents of the Seven Springs area prior to the end of World War II when the park was formed. The 350-yard trail is accessible to all, however, be forewarned that those who go to the trail's southern terminus will have a slightly arduous uphill hike back up. The section of the path adjacent to the cliff features a well-packed, gravel base and is ideal for those with limited mobility and those with mobility devices. Park visitors desiring to fish in the Neuse River should follow the 350 Yard Trail to its southern terminus on the river bank (follow the fish shaped signs). Those with young children are reminded to supervise them closely on all sections of this trail due to the potential hazards of the cliff and the river. Point of Interest: View of Neuse River from overlook. Access to park's fishing area on the Neuse River. Location: Located adjoining the Galax Trail and accessed by crossing the Mill Creek boardwalk at the base of the 350-yard Trail. The Bird Trail is one of the park's original trails that is accessed by hiking to the end of the 350-Yard Trail and then crossing the Mill Creek boardwalk. 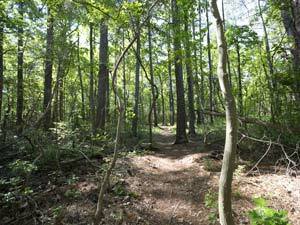 The Bird Trail joins the Galax Trail and takes hikers near another section of the park's cliffs along the Neuse River. Near this section of trail, the woods were occupied by both Union and Confederate soldiers in 1862 following the Battle of Whitehall (Seven Springs) and an undetermined number of pickets have been found on the park in more recent years. In the event of high water, hikers will need to follow the alternate trail sign to access the Lake Trail and then cross the lake spillway to access the Galax and Bird trails. 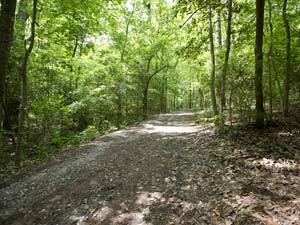 The park's Galax Trail is one of the original trails installed following the park's 1945 inception. Hikers may access the Galax Trail from the creek crossing on Mill Creek and from the spillway crossing on the Lake Trail. If high water has closed Mill Creek crossing, the spillway crossing remains passable. The park's namesake, Galax urceolata, is a leathery, green-leafed plant that grows low to the ground in moist forested areas. The plant was used by Native Americans for medicinal purposes and later, by settlers, as an ornamental. This trail will also feature native wild ginger. The Galax Trail features a wide array of hardwood species that include dogwood (North Carolina's state flower); white oak, cherry bark red oak, mockernut hickory, persimmon, and yellow poplar. Hikers will note that areas of the park with greater hardwood diversity will feature greater populations of gray squirrels while the areas with a more dominant longleaf pine component are home to a select number of eastern fox squirrels. Location: Trailhead is locate at the park's Visitor Center off Park Entrance Road. The park's two-mile-long Lake Trail is the most recent trail built on the park and was opened to the public in June of 2015. 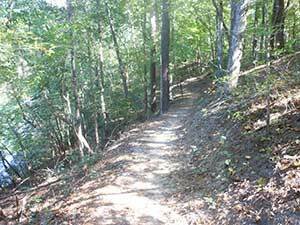 This trail features a three-foot width and a natural, sand base that makes it ideal for hikers or joggers. The exact two-mile length also provides joggers with a precise distance that can be used to judge work-out speeds. This trail winds through a previously-unused forested section of the park and provides a good look at many mature white oaks in addition to a variety of other hardwoods. With a lesser number of loblolly and longleaf pine featured, hikers who look closely may glimpse historic remnants of dead longleaf stumps that were used in the Naval Stores industry between 1750 and 1875. Hikers should expect to see white-tailed deer along this trail in the fall during the peak of the hard mast (acorn) drop. This trail leaves from the park's Visitor Center parking lot and travels around the 11-acre swim lake and crosses the lake spillway on a series of stepping stones. Hikers and joggers may gauge their progress easily since it is exactly one-mile to the wooden foot bridge built by division staff over a small creek. To complete the trip, hikers follow the main path up into the swim lake parking lot and continue on, or beside, the pavement back to the Visitor Center. Point of Interest: Remote forest of hardwoods and pine. Best trail on which to view fall leaf colors. Location: This trail forms a connection from the Visitor Center parking lot to the park's Sand Path. The park's Longleaf Trail was created in 2013 as a way to connect hikers and joggers from the Visitor Center to the park's Sand Path and then onto the Spanish Moss Trail. Following the trails in that order permits for a two-mile loop back to the Visitor Center. The Longleaf Trail is so named for the fact that it passes through the park's longleaf pine restoration area, a 75-acre section of mixed pine and hardwood that is being burned with prescribed fire on regular intervals to foster the dominance of the longleafs that originally were featured on the property. Two of the park's three oldest longleafs, used in the Naval Stores industry between 1750 and 1875, are still alive along this trail and feature the distinctive scarred bases that are indicative of past pitch collection efforts. For those who look closely enough, this section of forest also displays historic red-cockaded woodpecker dens on several mature longleaf pines also. Point of Interest: Longleaf pine restoration area. Former Naval Store trees. Historic RCW dens. Active eastern fox squirrel population.